I just using p tags to encompass a line, because br seems not to work. Its more simple then using divs and the differences in the output should be less once it is fixed. If I remember correctly much WYSIWYG Editors take use of p tags to manage double line breaks anyways. I like the most design suggestions that has been made here, especially the concept of TheBaDaBing!. The Forum is nice but completely different, to be improved. Hey, let's give this thread a break for a week. The more we post, the more messed up it looks. don't only say it? LMAO!! Maybe add things like boxes containing images of the game, maps, weapons etc.. and even recent news stories, links to comics, YT, Twitter,Facebook.. I would even like to say add a simple 'instant live chat applet' (similar to using IRC) but I can only assume that would be a nightmare to moderate but it would be something nice to save a lot of needless spam on the forum I guess.. no harm in asking It just feels a little plain right now but I know.. it's early to say that knowing your working on it. Above all, you should really try and make this forum look and feel more military, geared for your game.. I thought the old forum fit quite nicely with AA3's theme, twas a little dark and the black/grey with yellow text took a while to grow into, but it grew on me. This one actually is too the more I use it and learn of functions and navigation.. new forums are always gonna be alien at first and I cant say I've had any other experience with this Vanilla. Anyways, perhaps you guys can theme this forum specifically for AAPG. In any case.. I look forward to seeing the forum adapt to feedback and I'm sure you guys will do a great job. It does in fact have the default template. I have not quite had the free moment to theme it yet. We will get it taken care of though. Can you increase the posted body allotment to more characters? I tried to post a log file from my editor crash in the mission editor support forum but it cut the pasted code by 1,000 characters or so. 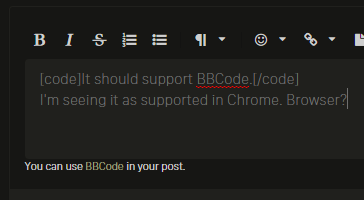 Also the wysiwyg editor doesn't offer "code"? And does not offer bbcode? I'm seeing it as supported in Chrome. Browser? I'm seeing "Attach Poll" at the bottom of discussions I've started, but the button seems to just take me to the Edit page (where I believe this plugin would normally show the options for setting one up). Permissions issue or just yet-to-be-fully-implemented? much better boxes now! !, thanks!! +1. But think titles, post counts, etc, would be better placed under each avatar so the post won't look so busy. Emails - How about a predefined set of characters, a post preview if you will, coming from the post your getting an email about?